The Trident II D5 missile is deployed aboard U.S. Navy Ohio-class submarines and Royal Navy Vanguard-class. The three-stage ballistic missile can travel a nominal range of 4,000 nautical miles and carry multiple independently targeted reentry bodies. The Navy is modernizing its arsenal of Trident II D5 nuclear missiles in order to ensure their service life can extend for 25 more years aboard the Navy’s nuclear ballistic missile submarine fleet. 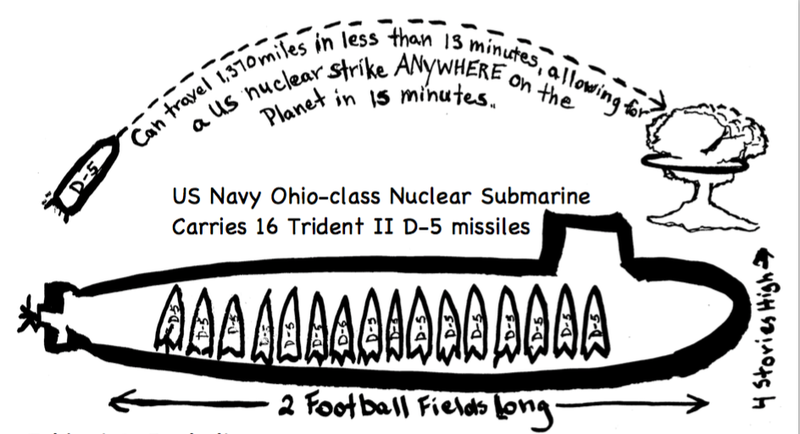 The 44-foot long submarine-launched missiles have been serving on Ohio-class submarines for 25 years. Six Tridents operate out of Kings Bay, GA. The Trident submarines at Kings Bay are likely to be used first in any nuclear attack, either as an isolated tactical assault on a specific site, bunker, or weapons location, or in a larger strategic nuclear attack. The D5 missile is capable of traveling over 1,370 miles in less than 13 minutes, allowing for a US nuclear strike anywhere on planet earth within 15 minutes. The Tridents are getting old, so, according to Defense One, the U.S. Navy is developing a replacement. Even if it comes in on time and on budget, it will be the country’s third most-expensive weapon system ever. It’s known as the Columbia-class submarine, the fifth type of U.S. ballistic missile submarine since the Navy started building them in 1959. Its designs were finished just three years ago; so far, it still only exists on paper. In all, the new Tridents will cost $122.3 billion. Production costs alone will run about $8.2 billion for the first sub, slated to arrive in 2028, and about $6.5 billion for the remaining 11.